Language studies support that early age introduction increases the likelihood that a child will achieve proficiency while developing a more native-like pronunciation. 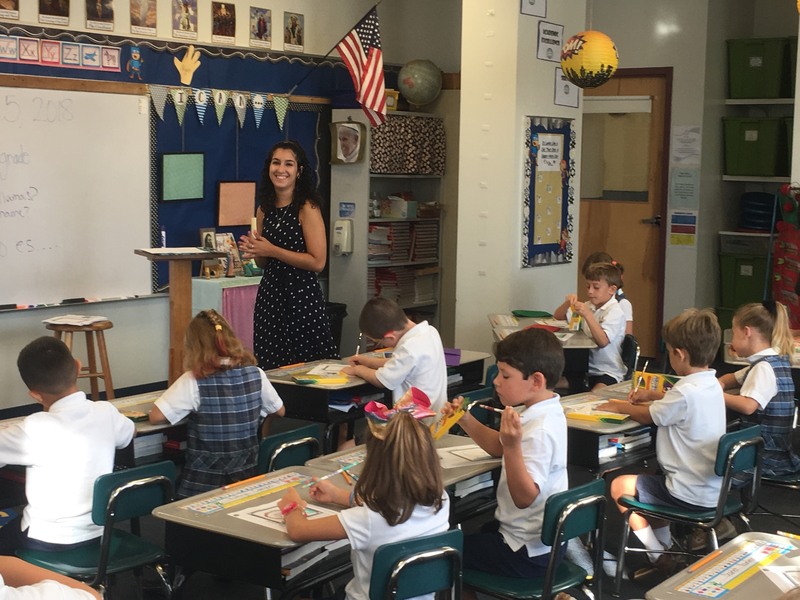 Students at St. Ann School begin language instruction at Age 3. Students in Pre-K 3 & 4 and Kindergarten learn basic communication skills and concepts through the use of thematic units, (colors, shapes, family, and the alphabet). The children learn the target language by singing songs, playing games, dancing, crafts, and total physical response to commands given by the teacher. Each of these developmental areas enhances language and expands their vocabulary. In Grades 1-5, the curriculum is based on the Muy Bien Series, Levels A and B. This curriculum is based on song, repetition, picture cards, felt boards and games. Children learn vocabulary and also expansion of sentence structure. Different types of assessments are used to determine the level of comprehension of the spoken language, word recognition and conversation. Vocabulary and grammatical structures are built on and expanded in Grades 3 through 5 where emphasis is placed on speaking, reading and writing. Spanish is taught at the middle school level for 45 minutes, three times a week, as well. The program emphasizes continued acquisition of vocabulary and conversation fluency, as well as proper use of grammar. The program also seeks to teach and strengthen reading and writing skills, building on the foundation of the elementary grades. The importance of the Spanish culture is emphasized through the use of integrated technology and the fine arts. Currently instruction is accomplished through the use of the Muy Bien Series, Level C and D, as well as the use of teacher created materials and commercially available worksheets.